Over the last few weeks we have started seeds for our summer garden. We’re right on the border for Hardiness Zones 6 and 7, so I follow the rules for Zone 6. 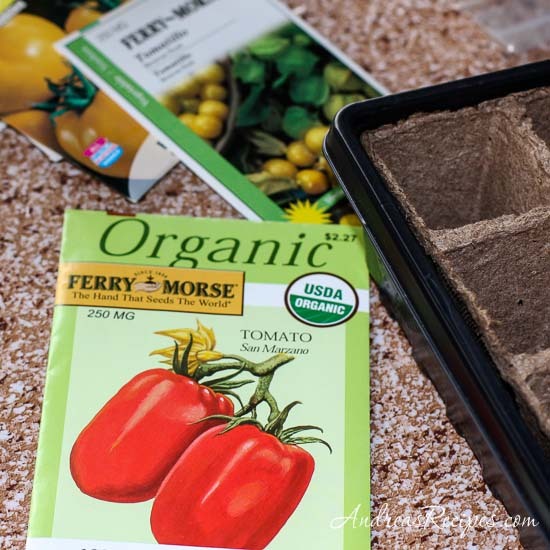 Because we often still have very cold temperatures in early May, our safe outdoor planting date is around the third week in May, and depending on the type of plant we start seeds as early as the beginning of March. 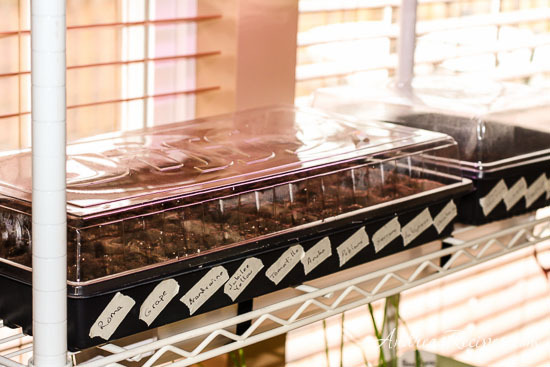 I separate our seeds into three groups: 1) start indoors (early March to early April), 2) plant direct in spring when the soil is workable (third week in March), and 3) plant direct after danger of frost has passed (third week in May). In the last two weeks, we have started celery, leeks, sweet peppers, chile peppers (jalapeno, ancho, serrano, anaheim, poblano), tomatoes (San Marzano, roma, grape, Brandywine, Jubilee yellow), eggplant (Black Beauty and lavender), marjoram, cilantro, stevia, and lemongrass, and in a few weeks I’ll start the basils (Genovese, lemon dani). Several of these can also direct seed when the weather is warm enough, but I always start some early in the hope that we will have something to put in the ground and have an early harvest. It doesn’t always work and last year not a single bell pepper sprouted so we had to buy plants, but most years we have seedlings ready to plant in May. We use simple seed starting kits that are widely available from places like Lowe’s, Home Depot, and local garden centers. We prepare the flats by writing the seed names on tape at the end of each row for easy identification, then pour in the soil and get it damp. We add three seeds to each pod, lightly add more soil and water, then cover with the lid and place under grow lights in our indoor garden area off the kitchen. The seed flats require regular watering, and it will take 7 to 21 days before we see sprouts. As the leaves grow, we remove the lids and eventually cut away the weaker plants, which helps the stronger plants to grow even stronger. Next weekend we are planning to put in our new raised beds, which will increased our vegetable and herb garden from 36 square feet to 153 square feet. Once those are set up we’ll put all the cool weather seeds in the ground. In related matters, I posted this week about saving money on your food bill by growing your own produce at The Daily Tiffin. The amount of money to be saved by growing your own food is amazing. ohhhh! i am looking forward to your gardening posts. spring is just around the corner yipppee! Looking forward to seeing what your raised beds look like going in. You certainly have a lot of plants to put in those beds! Will you be doing the same kind of cost comparison as Doiron? I’d be interested to know whether the cost of water in different parts of the country affect the amount of money saved. Have you read the book “The $64 Tomato”? Funny stuff. Hi Nate. We’ve talked about figuring out the savings several times. It would certainly be an interesting experiment. Water isn’t cheap here, and two years ago we had a drought. Lots of watering!